Over the years, I’ve stopped in at the Colville Street Patisserie a handful of times. I don’t usually start my days off with a pastry, but when you’re in Walla Walla, where it always feels like a mini vacation (er, not that I'm on vacation. This is day three of a four-day work trip. Research! ), it’s a natural morning stop. The patisserie opened in 2005, but current owners Tiffany Cain and David Christensen didn’t take it over until 2008. Cain previously owned the Weinhard Café in Dayton, while Christensen was the pastry chef at nearby Whitehouse-Crawford (arguably the most beautiful restaurant in Walla Walla). He’s also one of the bakers. 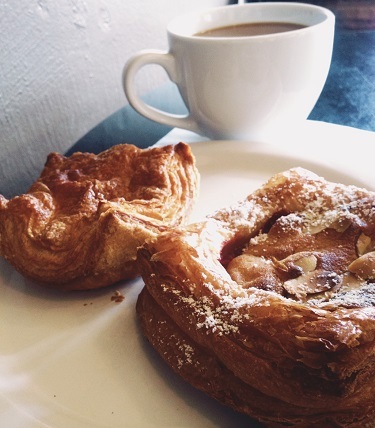 I try and pick out something from the gloriously dizzying pastry case every time I go in, but today I repeated an order: Kouign Amman (KWEEN ah-MAHN). There are some wonderful versions of this pastry in Seattle, but my favorite is here in downtown Walla Walla. If you’ve never had one, imagine a cross between a really great piece of buttered toast and a croissant; layers of flaky pastry dough with caramelized sugar and sea salt. It doesn’t look particularly exciting, but I have a theory that very little can go wrong with your day when you eat one of these things.